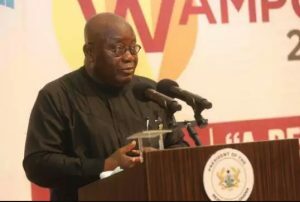 President Nana Addo Dankwa Akufo-Addo has called on mining companies operating in Ghana to begin manufacture many of the inputs they import locally. He said several of the tools and equipment they imported into Ghana could be produced locally; and thus keep the large funds used to procure them in the domestic market. Speaking at the opening of the 2018 West African Mining and Power Conference and Exhibition in Accra on Wednesday, the President said it was time the trend was reversed where almost all the input in the mining sector was imported. “It is time to reverse this trend. Ghanaian entrepreneurs must be encouraged to work with the Ministry of Trade and Industry and the Chamber to identify opportunities in the value chain, where indigenous companies can manufacture these products locally. “I know that mining inputs, such as caustic soda, activated carbon and grinding media, can be produced locally if businesses produce at competitive prices in the needed quantities and the right quality. The readily available raw materials for some of the inputs mean that there is great potential for interested investors. President Akufo-Addo said the mining sector ought to be a captive market for Government’s One District- One Factory initiative and help address the unemployment situation and grow the country’s manufacturing sector. He said job creation must be stimulated in an integrated manner through the value chain of the extractive sector, as the extractive sector was no longer a large employer of labour due to the improvement in the deployment of technology and innovation. “Government is empowering the private sector to create jobs and wealth by working closely with industry and academia to equip young professionals with the skills required to operate competitively in the sector. We are establishing a new paradigm of an integrated mining industry to propel local manufacturing,” he said. The President held that the value chain of mining had huge potentials for job creation, and the Government intended to tap into it to develop the economy. “We cannot, and should not continue to be merely exporters of raw materials to other countries. I call on all players in the sector to work with us to deepen the integration of the mining sector with the non-mineral sectors of the economy,” he said. See the full Day 2 WAMPOC programme HERE.